According to the Family Caregiver Alliance, most Americans will become caregivers at some point in their lives. In fact, family members provide 80 percent of the long-term care in this country—yet many feel unprepared for their role, and provide care with little or no support. Most family caregivers have other responsibilities—jobs, caring for children, and often as not, caring for more than one elderly relative. This makes it highly likely that caregivers’ own needs are put on the back burner. And the Family Caregiver Alliance reports that more than one-third of caregivers are dealing with health challenges of their own. If you’re one of the millions of people providing care to someone you love, there are several things you can do to reduce your workload. The first is to create a plan of action on how to deal with added stress in your life. People who take action to combat stress as opposed to ignoring it or falling into a feeling of helplessness are better able to deal with it. Here are seven tips to help caregivers beat the stress of caregiving. Become educated. Learn all you can about your loved one’s health conditions. This will allow you to know what may lie ahead so you can create action plans to mitigate the challenges. Some of the best sources of information are organizations dedicated to specific diseases, such as the Alzheimer’s Association, the American Heart Association, the American Cancer Society, the American Lung Association, and the National Parkinson Foundation. Their websites may also provide information about support groups in your area, which are can be a tremendous source of emotional assistance. Share your situation with others. If you have children, explain to them what’s going on. Explain that while you may be less available for them, you still love them and are interested in what’s happening in their lives. If you work, talk to your employer about creating a work schedule that accommodates your caregiving duties. Let coworkers know you’re still available to assist, but may need some additional time. Take advantage of community resources. There are numerous governmental and volunteer groups that may be able to provide some assistance. Meals on Wheels, local church groups, your local Area Agency on Aging or senior services organization may be able to provide you with information and assistance. 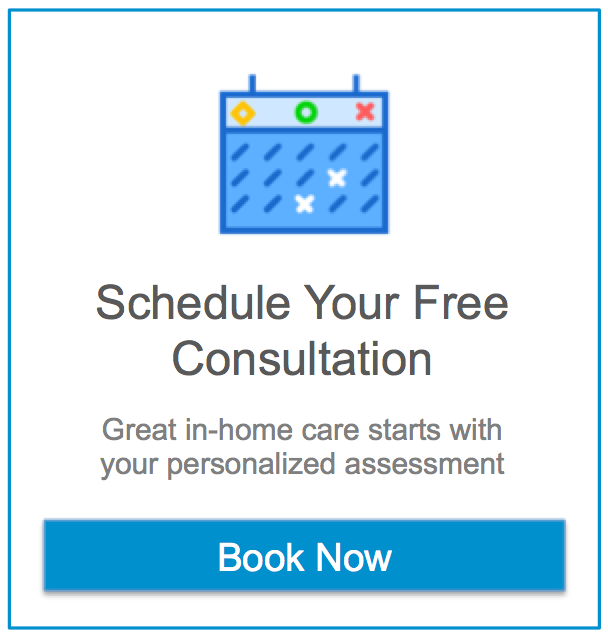 For many families, professional in-home care is the ideal solution for keeping loved one’s safe and well cared for while relieving caregiver stress. Share your feelings with someone you trust. Often, just being able to talk to someone—a friend or a trained therapist—about what’s going on can make a huge difference in a caregiver’s well-being. Not only will the act of sharing help reduce some stress, but the person you talk to may have suggestions on how to help ease the stress you’re facing. Ask for help. Don’t be afraid to lean on family and friends, even if it’s just to run by the pharmacy to pick up a prescription or stop by the grocery store for food. Family members who live at a distance might be willing to contribute to the cost of home care—a great way for them to know they’re both helping your loved one and helping you! By asking for help, you’re not only receiving a gift, but you’re also providing the opportunity for others to be of service. Create some “me” time. Make your own needs a priority. If this makes you feel guilty, recognize that in order to be an effective caregiver, you need to be healthy, alert and fully present. This can only happen if you’re taking care of your own needs—whether that’s spending some time with family and friends, going to see a movie, or taking a walk at a local park. It helps to establish boundaries with the person you’re caring for. Let them know exactly when you’re available to assist and when you’re not. Be gentle with yourself. Caregiving can be a roller coaster of emotions. You may feel sadness at the changes in your loved one. You may feel some anger or resentment at the role you have taken on and that it’s taking time away from your career or other family members. Acknowledge these feelings and understand they are completely normal and part of the role of being a caregiver. This article describes some common experiences of family who help elderly and disabled relatives. But did you know that today, many seniors are without family members to support their well-being? Learn more in “Home Care in the Forefront as More Seniors Live Alone,” the next article in this issue of the Assisting Hands Hand in Hand newsletter.